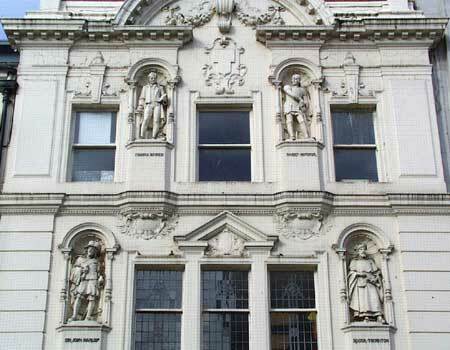 The statues of Thomas Bewick, Harry Hotspur, Sir John Marley and Roger Thornton. The façade of No. 45 Northumberland Street has previously been attributed to Morley Horder on account of its similarity to his designs for Boots shops elsewhere in Britain in the 1920's. However, plans submitted to W.J. Steele, Newcastle Town Surveyor, indicate that it was designed by M.V. Treleaven. The whole façade has recently undergone a restoration. Has anyone noticed that the statues are a little different. If you want to compare before and after to spot the differences follow this link.